U.S. Regulators Promise Oversight Of Offshore Drilling Contractors : The Two-Way Nearly 18 months after a disastrous oil spill killed wildlife and endangered businesses along the Gulf of Mexico, the federal government announces it will regulate not only the operators of offshore oil rigs, but the contractors who work on them, as well. 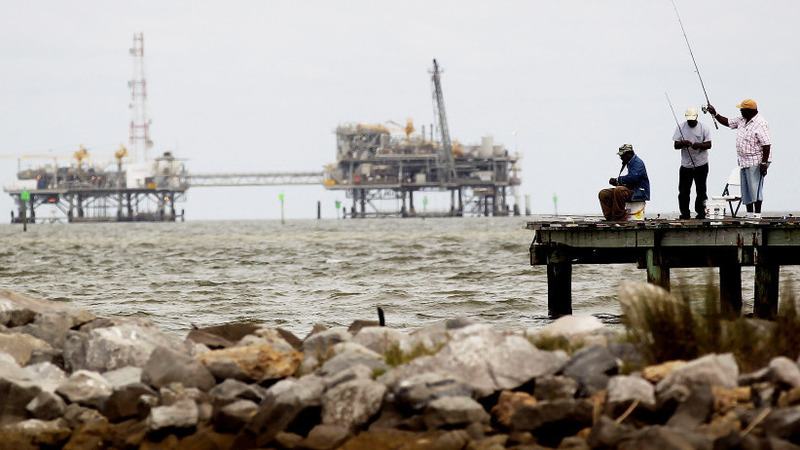 Men fish off a pier at a jetty in Dauphin Island, Ala., with oil rigs in the background. The U.S. government is changing how it regulates drilling platforms. Nearly 18 months after a disastrous oil spill killed wildlife and endangered the futures of fishermen and resort businesses along the Gulf of Mexico, the federal government announces it will regulate not only the operators of offshore oil rigs, but the contractors who own and work on them, as well. The shift in enforcement is one of several changes announced in the past 24 hours, as federal regulators seek to ensure the Gulf spill catastrophe does not recur. "We will regulate contractors as well as operators. There is no compelling reason or logic not to do so," Michael Bromwich, interim director of the Bureau of Safety and Environmental Enforcement, said at an oil conference, according to Reuters. After the spill in April 2010, harsh criticism was leveled at BP, which operated the rig and owned the drilling permits; Transocean, the contractor that owned the Deepwater Horizon rig; and Halliburton, which capped the leaking well. The federal agency in charge of monitoring the drilling, the Minerals Management Service, also came under harsh scrutiny — and was dismantled only one month later. Before the gulf spill, it had been common practice for the MMS to monitor only the operator of deep-sea oil rigs, not contractors. And before changing that, Bromwich said that he first had to be sure the agency wasn't overstepping its authority. "The lawyers said there was no doubt that we had the legal authority to do it," he said. "The question then became whether it was appropriate to do it, and I concluded that it certainly is." Bromwich made his pledge to regulate contractors shortly after being named the interim director of the new Bureau of Safety and Environmental Enforcement — an offshoot of the now-defunct U.S. Bureau of Ocean Energy Management, Regulation and Enforcement. The agency was split into two parts on Oct. 1, with the other half being the Bureau of Ocean Energy Management. The effects of the Deepwater Horizon spill are still being felt along the coast of Louisiana, where some seafood fishermen say their business has yet to return to normal. More than one month into the white shrimp season, fishermen say this year's harvest will be a small one. "I am talking to the guys, I am talking to the docks, and they are telling me that they are 80 percent off," Clint Guidry, president of the Louisiana Shrimp Association, tells the AP. "We should have had a good year this year." "We have done zero this year," said Randy Pearce, the plant's owner-operator. "We have not peeled one Louisiana white shrimp."